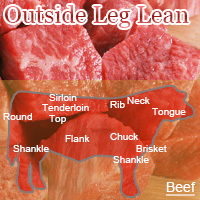 Lean beef-round or outside leg is often found cooked in beer to be tenderized. It is not fit for steak or making roast. It can be used to make cube steaks or bottom round roasts. The calories in Lean Beef Round per 100g(1cut ) is 127 calories. Lean Beef Round is calculated to be 127Cal per 100 grams making 80Cal equivalent to 62.99g with 21.2g of mostly protein、3.9g of fat、0.3g of carbohydrates in 100g while being rich in vitamins and minerals such as Vitamin B12 and Niacin.